In which we find ourselves firmly in the land of olive oil and spicy peppers. This is the third installment of a three-part series exploring the variances in Italian regional cuisine. Visit the Northern Italian regions here and Central Italy here. In this third and final part of the regional cuisine of Italy, we find ourselves firmly in the land of olive oil and spicy peppers. Southern Italy is where, with few exceptions, pasta is served as part of each meal. Generally, the cuisine leaves behind the richer butter and cream dishes and features spicier tomato-based pasta. In arbitrarily dividing Italy into three sections of north, central and south, some of the regions naturally commingle from one section to the next, with their feet sometimes firmly planted in both. The qualities that unite and separate one region from another are profound because Italy is a country united, barely 150 years ago, from autonomous countries with unique customs and food traditions. Through the years, regional dishes migrated up and down the peninsula and across the sea, sharing a respect for genuine ingredients and an Italian passion for their native regions' specialties first; embracing the others when it suits their taste. Located in the central heart of the Apennine mountains and bordering the Adriatic Sea, Abruzzo is one of the more sparsely populated regions. Its cuisine is based on simplicity, relying on the excellent quality of their ingredients. It is said that the Medici family so loved the region's lamb and cheeses that they sought to acquire land of their own here. , a tradition born in ancient pagan times, involves feasting on some 30 to 50 dishes throughout the day and well into the night. Today, the tradition carries on during festive occasions like Christmas or weddings. The Abruzzese love spicy peperoncino peppers and il diavolino, "little devil" chili peppers. The classic pasta all'Amatriciana is a chili-spiced pancetta red sauce that originated in the town of Amatrice, once part of Abruzzo until it became part of Lazio in the late 1920s. The dish features a uniquely Abruzzese pasta, the handmade chitarra, or guitar pasta, so named for the way that it is cut. The flattened dough is pressed through a stringed wooden cutter that resembles a harp or dulcimer and cuts the dough into square strings. Sometimes bucatini is used for pasta all'Amatriciana, but this is more a Roman tradition. Another famous pasta dish is Timballo, a dish using paper-thin scrippelle (crêpes) elaborately layered with rich ragu, polpettini (tiny meatballs), peppers or artichokes and finished with Scamorza, a local mozzarella-type cheese that melts perfectly and nicely pulls the whole dish together. They say it is so delicious that you will forget all about lasagna. Other Abruzzese specialties are spicy Ventriccina salami flavored with chili peppers, rosemary, fennel, and orange, or sausage variations which add foije, a local take on sauerkraut using preserved savoy cabbage and chili peppers. One of the area's most famous desserts is the Christmas specialty Caggionetti, fried dough filled with chestnut and chocolate liqueur. 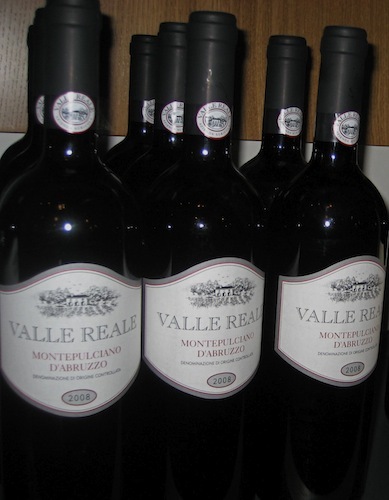 Wines of note include Montepulciano d'Abruzzo and Trebbiano. salad, named for the island of Capri, pairs water buffalo mozzarella with tomatoes and fresh basil. Unlike most of the other southern regions that are hilly or mountainous, Puglia is a fertile flat plain cultivating the all-important durum wheat, crucial in the making of pasta and bread. Puglia grows many grains, beans and vegetables, as well as producing the largest amount of olive oil in all of Italy. Pugliese olive oil is prized for its distinctive peppery flavor. , is delicious with tomatoes and arugula. Puréed fava beans with broccoli rabe is a classic Pugliese dish. , a cured and spiced tuna from Taranto. One of the most famous breads in Italy is the chewy rustic loaves of Altamura. , is made from a grape that was introduced by the Greeks and planted around the base of the volcanic Mont Volture, from whence it derives its name. is what most Americans know as pepperoni. , a native Calabrese hybrid, that is used to give Earl Grey tea its distinctive aroma. , a deep fried rice ball with cheese, ham and peas inside. , a fried chickpea fritter, is another. is an interesting and unusual combination of sardines, anchovies, wild fennel fronds, onions, a pinch of saffron, raisins, and pine nuts. , which, if you have never seen it, should be on your must-see list. Trapani province, long famous for its sea salt production, is also fond of couscous. They host an annual festival celebrating this north African influenced specialty. Ragusano cheese is a traditional favorite, traded around the world for hundreds of years. Their ricotta cheese is highly regarded especially when used in one of the most well known desserts of Sicily, the Cannolo. The Sicilians have a big sweet tooth, specializing in everything almond, from cookies, pastries, and marzipan miniature fruits. Cassata siciliana is a classic dessert alongside fruit granite that are legendary. The chocolate from Modica is uniquely different and tempting. Marsala wine is the most famous of wines but used almost more for cooking; for drinking, consider reds Nero D'Avola, Etna Rosso, Cerasuolo di Vittoria, or for white, Bianco D'Alcamo. is a sheep cheese produced in a mountain shepherd's hut, whose central open fire imparts its characteristic smoky flavor. is an unusual soft cheese similar to yogurt. I hope you have enjoyed exploring Italy's regional cuisine as much as I have. Naturally, this guide only scratches the surface, but perhaps has whetted your appetite to do a bit of exploring when you eat at an Italian restaurant and inspired you to try something new. Better yet, try and explore the place of origin and plan your next trip to Italy one region at a time. Italian Regional Cuisine: Part 3 of 3 (Southern Italy) originally published on the Menuism Italian Food Blog.